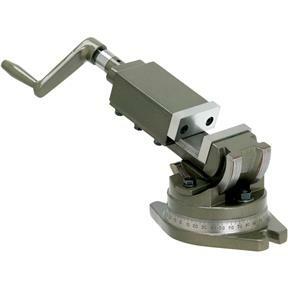 This small and lightweight vise is perfect for smaller mills or holding a small work piece on a big mill. The two way adjustment allows the rise to swivel and tilt for angular cutting. Jaw size is 2" wide and maximum jaw opening is 2-3/16" Very nice quality. Weighs 7.6 lbs. I recently purchased this 2" Two-Way Precision Angle Vise. It was well made and works will with my machine setup. I can easly do several new applications using the movement and accurate position of the tool once setup for the task I am working. I restore pre WW1 era long rifles, while fabricating a replacement trigger group for one I needed to mill several very odd compound angles on several of the parts. This vise allowed faster setups and quicker milling operations. Saved many hours of set up labor/time and gave me perfect results. Solid, well made vise! Also, FYI: I think your form has a typo, it should say "Maximum 50 Characters" rather than Minimum.